Chinese President Xi Jinping on Wednesday held talks with his counterpart of the Republic of the Congo Denis Sassou Nguesso, agreeing to promote the bilateral ties with greater and more substantial measures. Sassou Nguesso attended the 2018 Beijing Summit of the Forum on China-Africa Cooperation (FOCAC) on Sept. 3-4. Xi said the bilateral relationship is at its best in history, adding that China regards the Republic of the Congo as an all-weather friend and is willing to consolidate and deepen political mutual trust, expand high-level and all-level exchanges, boost experience sharing in governance, and strengthen communication on policies, concepts and strategies. China will firmly grasp the right direction of the Sino-Congolese relationship and continue mutual support on issues concerning each other's core interests and major concerns, and further substantiate the comprehensive strategic and cooperative partnership between the two countries, said Xi. Xi called for enhanced coordination and collaboration on key global issues and make the global governance system and the international order more just and equitable. China will unswervingly enhance mutually beneficial cooperation and welcomes the Republic of the Congo to join the Belt and Road construction, said Xi. 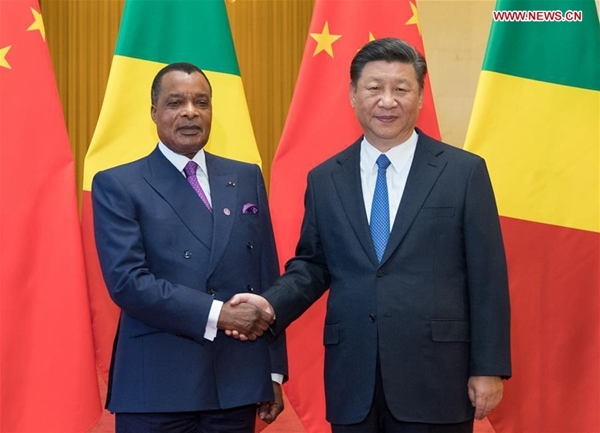 Sassou Nguesso said his country fully supports the Beijing Declaration and the FOCAC Beijing Action Plan adopted at the summit. The Republic of the Congo is grateful for China's long-term support and highly appreciates the Belt and Road Initiative and the concept of a community with a shared future for humanity as well as the eight initiatives proposed by President Xi, said Sassou Nguesso. He said the country will align its development strategy with the Belt and Road Initiative to accelerate the growth. The Congolese-Chinese friendship is unbreakable, said Sassou Nguesso, adding that his country will not be disturbed by those noises on Africa-China relations, and will be committed to enhancing the Republic of the Congo-China and Africa-China comprehensive strategic and cooperative partnerships. After the talks, the two leaders witnessed the signing of bilateral cooperation documents.